This is a COMPLETE O-Ring Rebuild Kit, our kit has all the O-Rings and Gaskets that are installed in your pump. A Viton shaft seal is recommended for salt and ozone systems. All O-Rings and Gaskets are high quality aftermarket replacement parts, unless specified OEM. A Packet of O-Ring Lube is included that is approved for use on O-Rings, and all products are in reclosable bags. OEM Seal Plate Gasket Almond, (Pumps Pumps Pre-2/1/08) 357102 and a Seal Plate O-Ring (Pumps Pre-1994, not Shown in Picture) 071445. Diffuser O-Ring 355227 or 071444. Lid O-Ring (Pumps After 11/98) 350013 and a Lid O-Ring (Pumps Pre-11/98) 071422. 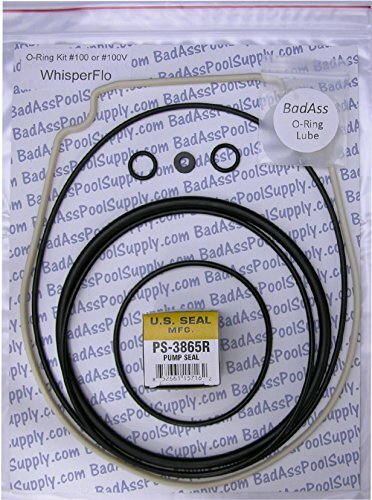 US Seal PS-3865R VITON Shaft Seal, O-Ring Lube and Directions.